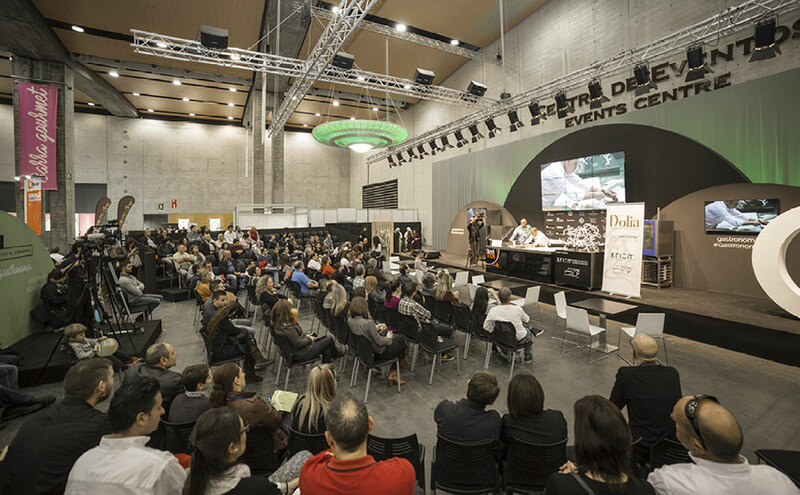 From the 19th to 21st of December, at the Feria Valencia conference centre, Gastrónoma 2016 took place; the large gastronomy event of the Valencian Community, seeking to establish itself as the largest gastronomy event in Spain. Show cooking, tastings, courses, gourmet bars and star chefs were present for theAuditori Teulada Morairaauditorium to present its event “Dolia: Fusión entre dos artes” (combination between two arts), expanding its activities at a national level and presenting this innovative new concept with participation from Manuel Alonso, Restaurante Casa Manolo, with a Michelin star, and Quico Torres, a sculptor from Benisa, Alicante, an expert in the solid surface from PORCELANOSA Group, KRION®, which he has taken around the world, presenting its dynamic artistic possibilities. KRION® formed part of this event, as a common element in arts as diverse as gastronomy and sculpture, a challenge for both disciplines and an honour for KRION®.